1. Which of the following processes is responsible for weathering of rocks in the Karst region? 3. Which one of these glacial features is believed to have formed in the bed of a sub-glacial stream? 4. Indian Meteorological Department (IMD) has divided India into how many seismic zones? Which of the above conditions promote inversion of temperature? (A) increase in evaporation and decrease in admixture of fresh water. (B) decrease in evaporation and increase in admixture of fresh water. (C) Decrease in evaporation and no change in admixture of fresh water. (D) Increase in evaporation and increase in admixture of fresh water. Assertion (A): The salinity in Dead Sea is very low. Reason (R): Dead Sea is located in tropical dry climatic region, where evaporation is high, precipitation is low and here drainage is internal. 13. Which one of the following primary greenhouse gases is not associated with global warming? 15. Which one of the following is a Taiga Biome? b. Ellen Churchill Semple ii. U.K.
c. Peter Haggett iii. U.S.A.
17. Who among the following defined Geography as Discovery of Predictive Patterns during quantitative revolution period? 19. Who founded the Humanistic School of Geography? 20. Who amongst the following correlated colour of ocean water and its salinity? 22. Which school of thoughts developed the Science of Astronomy? (B) 3 and 4 are correct. (C) only 1 is correct. (D) 1 and 2 are correct. 24. Name the State which employs the highest number of child labour in the country. 26. Diego Garcia is an island in which of the following oceans? Assertion (A): Urbanization is a defining phenomenon of this century and the developing countries are at the locus of this transformation. Reason (R): The urban shift has happened in the last few decades largely due to rapid mega cities growth in the developing countries. 30. The location of paper industries is highly influenced by which one of the following factors? 31. Which one of the following is the largest volume of import commodities in India? 33. To which racial groups the Eskimos belong to? 35. Which one of the following Islamic countries is predominantly of Shia sect? 36. Who, among the following, propounded the concept of compage? 39. Which of the following was the earliest regional planning exercise in India? 40. 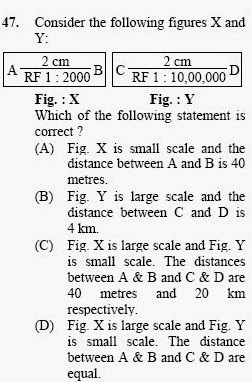 Which of the following is an incorrect pair? 41. Which one of the following States has the longest coast line? 42. In which of the following States of India the concentration of laterite soils is higher? Assertion (A): Laterite soils are well developed in Kerala. Reason (R): Kerala receives high rainfall during monsoon season. (A) (A) and (R) are correct and (R) explains (A). (D) (A) and (R) are correct, but (R) does not explain (A). Assertion (A): Himalayan Rivers are perennial. Reason (R): The region gets rainfall from the South West monsoon season only. (B) (A) and (R) are correct, but (R) does not explain (A). 45. The ‘Valley of Kashmir’ lies between which of the following ranges? 46. Which one of the following regions has the highest proportion of agricultural land under irrigation? 48. If the variability of rainfall is to be measured, which of the following techniques will be used? 49. Which of the following is not a Quantitative Distribution Map?